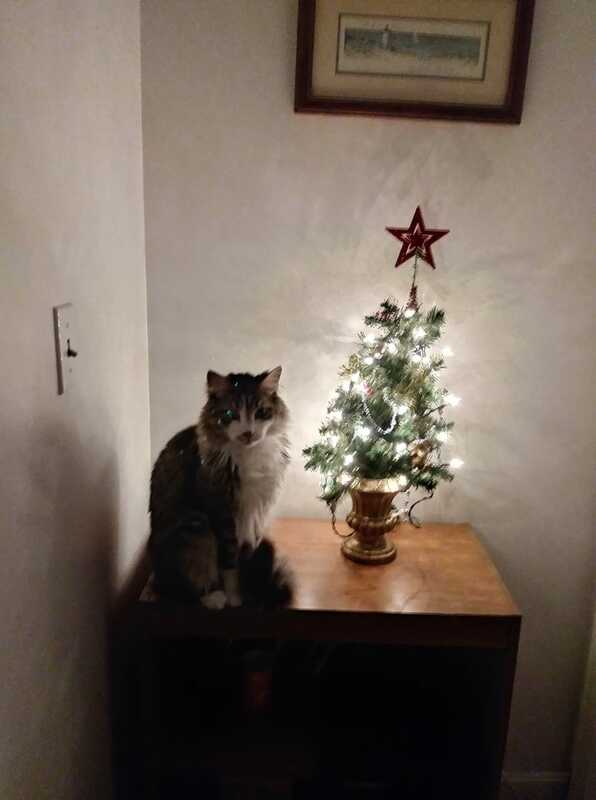 Cat owners (AKA: humans owned by cats) understand the struggle: You put up your Christmas tree and bedazzle it with ornaments (some of which are fragile and precious), only to face the disappointment and disaster caused when your feline friend decides to check out the cool, new household decorations. As an experienced cat companion, I’ve experienced crashing ornaments a time or two. I’ve even had our two cats get into a fight in the tree, sending it crashing to the ground. Anchor the tree to the wall. Some hardware stores sell kits for this purpose, but you can also use fishing line and screws to anchor the top of your tree to the wall. Consider skipping the fragile keepsake ornaments in favor of plastic ornaments that won’t shatter when they fall. Do NOT use tinsel. 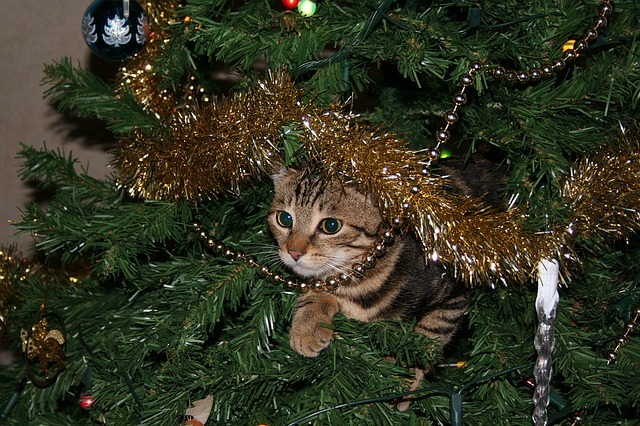 Cats love to play with tinsel, but if they eat it, it can cause a digestive blockage. Buy fake poinsettias. Real poinsettias are poisonous to cats, so buy artificial Christmas flowers in order to keep your kitty safe. Cover the tree water. 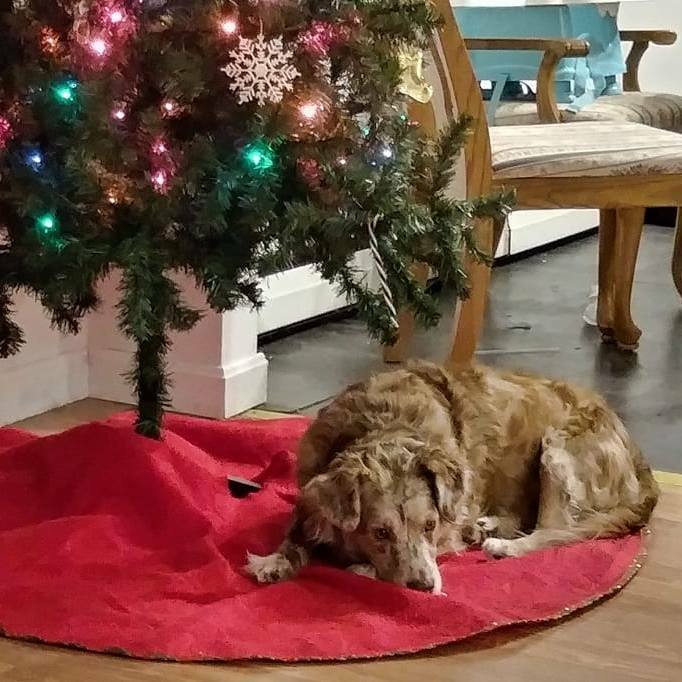 If you have a live tree, cover the tree water to keep your cat from drinking it. Tree preservatives can contain pesticides and other chemicals. Spray the tree. Some cats will chew on pine needles, which can cut their tongues or even cause digestive issues. To prevent your cat from chewing, you can spritz your tree with no-chew spray that you can buy from the pet store, or ask your vet what they would recommend. Keep your cats restrained. 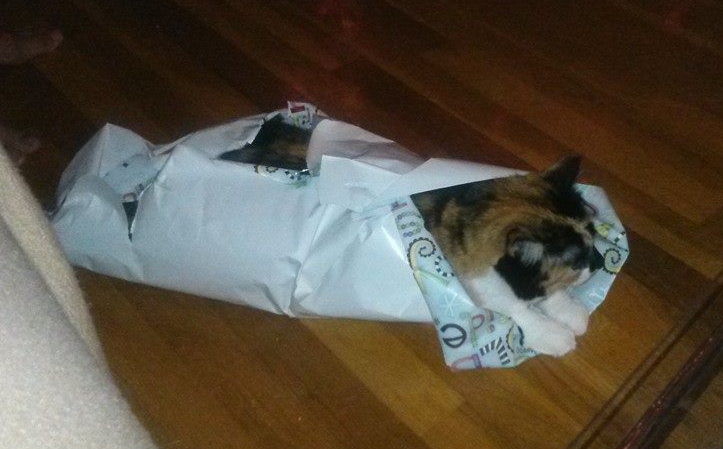 Pixel will never break free of this indestructible wrapping paper. Never! I hope you all have a safe and enjoyable holiday season!